The Commonwealth of the Bahamas is an English-speaking archipelagic nation on the northwestern edge of the West Indies. The Bahamas consist of 700 islands and cays, only about 30 of which are inhabited, and more than 2,000 low, barren rock formations. It is located in the Atlantic Ocean, east of the U.S. state of Florida and north of Cuba, northwest of the British dependency of the Turks and Caicos Islands and is considered one of the Caribbean Islands. The original native inhabitants of the Islands at the time of Columbus' landing, the Taino (Arawak) Indians, were decimated through slavery, warfare, and disease, after being taken to neighboring islands by the Spanish. Today, the country enjoys the third highest per capita income in the Western Hemisphere, and the highest in the Caribbean (excluding the dependent territories of Bermuda and the Cayman Islands). Since Havana, Cuba, closed for American tourists in 1961, the Bahamas has developed into a major tourist resort, with amazingly clear waters, lush tropical landscapes, and white sandy beaches. The name "Bahamas" is derived from the Spanish words "baja mar," meaning "shallow seas." The Islands of The Bahamas form a 100,000 sq-mile archipelago that extends over 500 miles of what is considered by many to be the clearest water in the world. The 700 islands, including uninhabited cays and large rocks, total an estimated land area of 5,382 sq miles, and register a highest land elevation of 206 ft.
Bimini, the closest island to the United States, is also known as the "Gateway to the Bahamas," while Grand Bahama is the closest major island. Other notable islands include Inagua, the third largest island; Andros, the largest and least explored of all the islands; however it is well known to snorklers and scuba divers for it has the second largest reed in the Northern hemisphere. Abaco, Eleuthera, Cat Island, Long Island, San Salvador, Acklins, Crooked Island, Exuma and Mayaguana, are other major islands included in the Bahamas. On the island of New Providense lies the capital of The Bahamas, Nassau. In the southeast, the Caicos Islands, the Turks islands, Mouchoir Bank, Silver Bank, and Navidad Bank, are geographically a continuation of the Bahamas, but not part of the Commonwealth of the Bahamas. The climate of the Bahamas range in the area of subtropical to tropical, and is significantly moderated by the waters of the Gulf Stream, particularly in the winter. Conversely, this often proves very dangerous in the summer and autumn, when hurricanes pass near or through the islands. In 1992, Hurricane Andrew hit the northern islands. In 1999, Hurricane Floyd hit most of the islands. Hurricane Frances of 2004 was expected to be the worst storm ever for the islands. Later in 2004, the northern Bahamas were hit by a less potent Hurricane Jeanne. In 2005, the northern islands were once again struck, this time by Hurricane Wilma. In Grand Bahama, tidal surges and high winds destroyed homes and schools, flooded graves and roughly put 1,000 people out on the streets, most of whom lived on the west coast of the island. The homeless were without food, water, and resources. The Islands of The Bahamas offer an overwhelming variety of historical, cultural, and natural attractions on its 700 islands and 2,400 cays. Although the size of The Bahamas is traditionally estimated by its land mass (about 5,400 square miles, including many uninhabited rocks and isles), the islands extend over a marine territory of about 100,000 square miles (almost twice the size of Spain). This marine expansion is as important as the land mass itself, while the land provides a place to live, the sea is a place to play and explore, offering an abundant variety of marine life. Most people visit The Bahamas for its clear waters and pleasant climate. Almost 5 percent of the world's coral reefs are located here, an amount surpassing even Australia's Great Barrier Reef. Because The Bahamas is an island nation, there are only two native mammals, the raccoon, and the hutia, a tropical version of the guinea pig. Larger mammals foreign to the islands were introduced during colonization. Mammals such as wild donkeys, wild boars, and horses, roam in less populated areas, while whales and dolphins often visit the waters nearby. Reptiles and amphibians such as the endangered Bahamian rock iguana, the Cat Island terrapin and the Hawksbill turtle share the cays and islands of the Bahamas with the largest nesting colony of West Indian flamingoes in the world, as well as nesting colonies of the Bahama parrot. Unlike New World parrots, the Abaco parrot nests in natural limestone cavities in the ground. Because of their nesting habits, they become more vulnerable to the islands' native predators, especially the wild cats of the Abaco forests. While the islands of The Bahamas are not entirely lush, their flora is distinctive, colorful, and varied. Among the Bahamian plants is the bull vine whose bright red blooms attract butterflies, the wild grape, several species of fig, and the bold color and shape of the bromeliad. Wild tamarind and pigeon plum trees are also found no the islands, both of which produce edible fruit, and the omnipresent casuarina pine. The variety of national parks envelope a wide range of environments, from hardwood forests and whiteland coppices, to sand dunes, and nearly impenetrable mangrove flats. Bahamians have a strong tradition of appreciating and protecting their environment which is why the 12 government–funded national parks of The Bahamas are exceptionally well kept. They exist on many islands, encompassing every kind of habitat that the islands possess, and range in size from the 40 acres known as Lucayan National Park to the 20,000 acre National Park on the island of Abaco. Some of the islands as seen from a plane. Paleo Indians may have populated the area before Christopher Columbus landed on San Salvador. However, by the time of his arrival in 1492, Taino Indians from Hispaniola and Cuba had moved into the southern Bahamas. Columbus called them the Lucayans. A peaceful tribe, he said of them, "They brought us parrots and balls of cotton and spears and many other things, which they exchanged for the glass beads and hawks' bells. They willingly traded everything they owned…. They were well-built, with good bodies and handsome features…. They do not bear arms, and do not know them, for I showed them a sword, they took it by the edge and cut themselves out of ignorance. They have no iron. Their spears are made of cane." When Columbus arrived there were an estimated 40,000 natives. Between his arrival and 1508, the entire population was taken to Hispaniola (Haiti and the Dominican Republic) by Spanish raiders to work as slaves in the mines. There they endured forced labor, warfare, and disease. The Bahamas Islands remained virtually unoccupied until English settlers arrived from Bermuda in 1647. The Bahamas became a British crown colony in 1718, but remained greatly unsettled until the recently independent United States expelled around 8,000 loyalists with their slaves from New York, Florida, and North and South Carolina. The United Kingdom Emancipation Act came into affect on August 1 of 1834, thereby ending slavery in the Bahamas. This led to many fugitive slaves from the United States braving the dangers of the Atlantic Ocean for the promise of a free life in the Bahamas. During the American War of Independence the Bahamas fell to Spanish forces under General Galvez in 1782. After the American Revolution, the British government issued land grants to a group of British Loyalists, causing the sparse population of the Bahamas to triple within just a few years. The settlers attempted to grow cotton, but the lime soil wasn't suited for it, and the plantations soon failed. When the United Kingdom outlawed the slave trade in 1807, the Royal Navy began intercepting ships and depositing freed slaves in the Bahamas. Therefore many of the current inhabitants are descendants from the slaves brought to work on the Loyalist plantations. Plantation life ceased after the emancipation of remaining slaves in 1834. During the American Civil War, The Bahamas prospered as a center of Confederate blockade-runners, bringing out cotton for the mills of England and running in arms and munitions. After World War I, the islands served as a base for American rum-runners. During World War II, the Allies centered their flight training and antisubmarine operations for the Caribbean in the Bahamas. Since Havana, Cuba closed to American tourists in 1961, The Bahamas has developed into a major tourist resort. At the same time, Freeport was established as a free trade zone, and became an off-shore financial services center with a reputation for a tolerant atmosphere. The British made the islands internally self-governing in 1964. In 1973, The Bahamas became fully independent but retained its membership in the Commonwealth of Nations. In circumstances similar to those of the southern states of the United States, the country's black majority was economically oppressed and socially excluded, until the election of Sir Lynden Pindling and his government toward the end of the 1960s. Based on the pillars of tourism and financial services, The Bahamas' economy has prospered since the 1950s. Today, the country enjoys the third highest per capita income in the Western Hemisphere, and the highest in the Caribbean (excluding the dependent territories of Bermuda and the Cayman Islands). Despite this, the country still faces significant challenges in areas such as education, healthcare, international narcotics trafficking, correctional facilities and illegal immigration. Urban renewal projects have been launched in recent years to help build up dilapidated urban areas and stem social decline in the main islands. The government of the Bahamas take place in a framework of a parliamentary representative democratic monarchy, whereby the Prime Minister is the head of government, and of a pluriform multi-party system. The Bahamas is an independent country and Commonwealth Realm. It is a parliamentary democracy whose political and legal traditions closely follow those of the United Kingdom. The non-resident Queen (of England) is the ceremonial head of state, represented by a Bahamian Governor General. The Prime Minister is the head of government and is the leader of the party with the most seats in the elected House of Assembly. The upper house, the Senate, is appointed. Executive power is exercised by the cabinet. Legislative power is permanent in both the government and the two chambers of parliament. As head of state, Queen Elizabeth II is represented in the Bahamas by a Governor General who acts on the advice of the Prime Minister and the cabinet. The leader of the majority party serves as Prime Minister and head of government. The cabinet consists of at least nine members, including the Prime Minister and ministers of executive departments. They answer politically to the House of Assembly. The House of Assembly consists of 40 members, elected from individual constituencies for five-year terms. As under the Westminster system, the government may dissolve the parliament and call elections at any time. The House of Assembly performs all major legislative functions. The party system is dominated by the center-left Progressive Liberal Party and the center-right Free National Movement. A handful of splinter parties have been unable to win election to parliament. These parties include the Bahamas Democratic Movement, the Coalition for Democratic Reform and the Bahamian Nationalist Party. The Bahamas has strong bilateral relationship with both the United Kingdom and the United States, represented by a High Commissioner in London and by an ambassador in Washington, D.C. The Bahamas associates closely with other nations of the Caribbean Community (CARICOM) as well. The Bahamas works closely with CARICOM and the United States on political and migration issues related to Haiti, to whom The Bahamas also has an Ambassador. The Bahamas has diplomatic relations with Cuba, resulting in embassies in each other's capitals. In 1996, a repatriation agreement was signed with Cuba, as well as there being commercial and cultural contacts between the two countries. The Bahamas also appreciates a strengthening relationship with China. In 1973 the Commonwealth of The Bahamas became a member of the United Nations, as well as becoming a part of the Organization of American States nine years later in 1982. 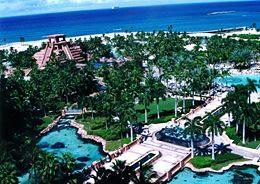 The Bahamas is a stable, developing nation with an economy dependent upon tourism and offshore banking. Steady growth in tourism and an outburst in construction of new hotels, resorts, and residences have led to a solid Gross Domestic Product (GDP) growth in recent years. However, the slowdown in the United States' economy and the attacks of September 11, 2001, held back growth in those areas in 2001 through 2003. Financial services constitute about 15 percent of the GDP, the second most important economic region of the Bahamian economy. Since December 2000, when the government enacted new regulations on the financial department, many international businesses left the Bahamas. Agriculture and manufacturers together contribute approximately one-tenth of GDP and show little growth, despite government incentives aimed at those financial regions. Overall growth prospects in the short run rest heavily on the fortunes of the tourism department, which depend on growth in the United States, the source of more than 80 percent of the visitors. In addition to tourism and banking, the government supports the development of a "third pillar," E-commerce. 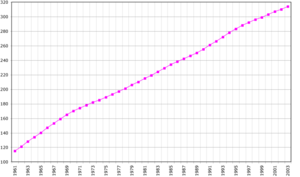 Demographics of Bahamas, Data of FAO, year 2005; Number of inhabitants in thousands. Eighty-five percent of the Bahamian population is of African descent. About two-thirds of the population lives on New Providence Island, with about one-sixth of the population living on Grand Bahama. Freeport, the most widely known free trading port, is on Grand Bahama. The islands were sparsely settled and considered a haven for pirates until the late 1700s when thousands of British loyalists and their slaves were given compensatory land grants following the American Revolution. School attendance is mandatory between the ages of five and 16. There are over 150 public schools and more than 50 private schools in The Bahamas serving more than 66,000 students. The College of The Bahamas was established in 1974 in the capital city of Nassau, and provides programs leading to bachelors and associate degrees. The college is currently converting from a 2-year to a 4-year institution. Junkanoo celebration in the Bahamas. The Bahamian culture is an expression of African and European influences. Its most spirited form of expression could be considered "Junkanoo," a rhythmic national festival that takes place every year from December 26 until New Years on January 1. 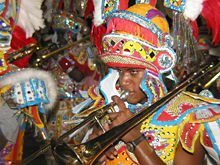 Junkanoo first began in the sixteenth and seventeenth centuries when the slaves of the Bahamas were given permission to leave their owners' plantations at Christmas time to visit their families to celebrate the holidays with traditional African music, dance and costumes. The celebration has continued even after emancipation. Today, Junkanoo has evolved from its simple origins to a formal, more organized parade with sophisticated, intricate costumes, themed music and incentive prizes. It is unclear of the origin of the word Junkanoo. Three likely possiblities remain even after years of discussion. L'inconnu meaning "the unknown" in French, in reference to the festive masks worn by paraders. Or "junk enoo," the Scottish colonizers references to the parades meaning 'junk enough'. The last possibility is that it came from the name "John Canoe," an African tribal chief who insisted that he be allowed to celebrate with his people even after being brought into slavery in the West Indies. Aside from Junkanoo, other native forms of music include rake and scrape, calypso, and a unique form of hymn, known internationally through the music of the late Joseph Spence. Marching bands are also an essential part of life, playing at funerals, weddings, and other ceremonial events. Beautiful landscapes and vibrant houses and peoples of the Bahamian archipelago have inspired many artists both native and foreign. Some notable Bahamian artists include Amos Ferguson, Eddie Minnis, Brent Malone, Jackson Burnside, John Beadle, and John Cox. Traditional crafts include straw work on most islands, with each one having a unique plaiting or braiding style, creating beautiful hats and baskets. This skill was useful when Bahamians led subsistence lifestyles, with baskets being used for carrying fruit and fishing traps. In the less developed outer islands crafts continue as a way of passing the time and basketry is commonly included in craft development, being made from palm fronds. Today, strawwork and wood carvings are produced and sold to tourists in Nassau's Straw Market. With the Bahamas being an extremely religious country, there are many more places of worship per person than any other nation in the world. The islands are 80 percent Protestant Christian. Baptists form the largest denomination with approximately one-third of the population, followed by the Anglican and Roman Catholic churches. A few Bahamians, especially in the southern and eastern islands, practice Obeah, a spiritualistic religion similar to Voodoo. Voodoo is also practiced by the large number of immigrants from Haiti, Cuba, Jamaica, and the Dominican Republic. While well known throughout the Bahamas, Obeah, and Voodoo are shunned by many Bahamians. Cricket is the national sport of the Bahamas. Although British sports like cricket, soccer, and rugby have some following, American sports such as basketball, softball, baseball, and American football are more popular. In addition, track and field is very popular. In the 1964 Summer Olympics, Bahamians Sir Durwood Knowles and Cecile Cooke won gold medals in sailing. In 2000, the women's relay team won the 4 by 100 m relay in track and field, and in 2004, Tonique Williams-Darling won in the 400 m race. ↑ Central Intelligence Agency, Bahamas, The The World Factbook, October 18, 2011. Retrieved October 23, 2011. ↑ •General Situation and Trends. Pan American Health Organization. Retrieved October 23, 2011. ↑ "Mission to Long Island in the Bahamas", Evangelical Association of the Caribbean. Retrieved October 23, 2011. ↑ 1973: Bahamas' sun sets on British Empire. BBC News (July 9, 1973). Retrieved October 23, 2011. ↑ 6.0 6.1 6.2 6.3 The Bahamas. International Monetary Fund. Retrieved October 23, 2011. ↑ The Islands of the Bahamas, About The Bahamas. Retrieved April 11, 2007. ↑ Geographica, ECO-ADVENTURES in the Bahamas. Retrieved April 22, 2007. ↑ Clements R. Markham, The Journal of Christopher Columbus (during His First Voyage, 1492-93) and Documents Relating to the Voyages of John Cabot and Gaspar Corte Real. (1893), Google Books. Retrieved April 25, 2007. ↑ U.S. Department of State, Foreign Relations. Retrieved April 11, 2007. ↑ The Islands of the Bahamas, Junkanoo. Retrieved April 24, 2007. Albury, Paul. 1976. The Story of the Bahamas. New York: St. Martin's Press. Cash, Philip, Don Maples, and Alison Packer. 1987. The Making of the Bahamas: A History for Schools. Harlow: Longman Caribbean. ISBN 9780582028050. Craton, Michael. 1962. A History of the Bahamas. London: Collins. Craton, Michael, and Gail Saunders. 1992. Islanders in the Stream: A History of the Bahamian People. Athens: University of Georgia Press. ISBN 9780820313825. Encyclopædia Britannica. 2007. The Bahamas. 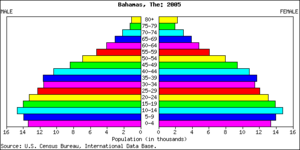 Encyclopædia Britannica Online. Retrieved April 25, 2007. Johnson, Howard. 1996. The Bahamas From Slavery to Servitude, 1783-1933. Gainesville, FL: University Press of Florida. ISBN 9780852550854. Miller, Hubert W. The Colonization of the Bahamas, 1647–1670. The William and Mary Quarterly 2 (Jan 1945): 33–46. Saunders, Gail. 1996. Social Life in the Bahamas, 1880s-1920s. Nassau, Bahamas: Rosebud. ISBN 9789768108029. Saunders, Gail. 2004. Bahamian Society After Emancipation. Kingston, Jamaica: Ian Randle. ISBN 9789766370848. U.S. Department of State. Background Note: The Bahamas. Retrieved April 22, 2007.
International Financial Centre of Choice – Bahamas Financial Service Board. This page was last modified on 23 November 2015, at 23:05.